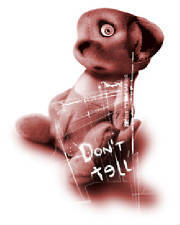 On this home page I'll introduce sexual child abuse and talk about all you need to know. Whether you're a survivor, observer, or just want to know about it. Being a sexual assault victim myself, I wanted to offer help to others. Those teens who don't want to tell anyone, but need to talk. With me, you're story stays with me and you do not have to give your name. I will do my best to help in any way possible. If you or a friend need to talk, come to me. Maybe I can help you in ways some others can't. If you're just learning about sexual abuse of a child, then you may email me. I have links here also that may be of some help to you. If you need anything email me and I'll do my best to answer. If I can't I will surely find the answer for you. Enjoy the site and I hope I can help you no matter your endeavor. I am 18 years old. Sexually abused at the age of 7 and 8. And was sexually harrassed by my grandfather. I'll do what I can to help you, if you give me the chance. Hold your head up high and know that it isn't your fault. They did this to you and that makes it there fault. It's not your fault. Please believe that. And if there is anything you need email me. I also have AIM and yahoo if you need to talk that way. I want to help. But if not I can give you the proper numbers and do my best to help you in any way that I can.